Fiber: What is it good for? UVM Medical Center Blog » Blog » Fiber: What is it good for? It’s hard to change the way that you eat. How can you incorporate healthier foods into your diet when you don’t know which foods are healthy? Or, maybe you can pick out healthy foods, but they taste like cardboard to you. Let’s discuss some quick and easy tips to add more (delicious!) fiber to your diet. Hold on, what is fiber? Fiber is the parts of plants that our body can’t digest. 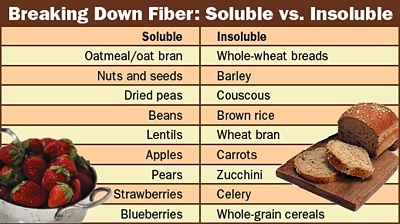 There are two different kinds of fiber and both are important to include in a balanced diet: soluble and insoluble. Soluble fiber: Soluble fiber soaks up water and turns into a gel that lines the colon and keeps waste from getting stuck there. It also helps lower your cholesterol because it binds to cholesterol and escorts it out! When you eat soluble fiber, your body digests and absorbs food more slowly so that you don’t get big ups and downs in your blood sugar levels, which can make you tired. Where do I get it? Oat bran, fruits, vegetables, brown rice, nuts, beans and barley. Insoluble fiber: Insoluble fiber travels through your digestive tract without changing its form much. This keeps all of your waste moving through your body so it doesn’t get stuck, which reduces your risk of constipation and hemorrhoids, and keeps your bowel healthy. Where do I get it? Fruit and vegetable skins, beans, and whole grain breads and cereals. How much fiber do I need to eat? Women should try to get 21-25 grams and men 30-38 grams a day. If I eat more fiber, am I going to be passing gas all day long? No, you don’t have to be! Start with small snacks and portions and spread all your fiber out throughout the day instead of all in one meal. Let your body get used to all this new food! If I add more fiber to my diet, will I gain weight? No! Fiber helps you to feel full longer and keeps you from snacking too much between meals. Most fiber-filled foods are lower in calories than low-fiber foods. Drink plenty of water to make sure that everything keeps moving through your body! Leave the skins on fruits and veggies. Add some beans to your salads and other dishes! Find out here which foods have more fiber! March 21, 2017 Added Sugars: Can You Pick Out Added Sugars on a Nutrition Label? This entry was posted in Wellness Tips & Wellness Articles. Bookmark the permalink.